It is easy to say it now but I had a feeling about Raikkonen all weekend; the doubts seemed to have vanished and he looked like the determined Kimi of old. That may have had something to do with the Ferrari team knowing they had the fastest car but I think there was more to it in Raikkonen's case. He has the car as he wants it now and will be the Ferrari driver to beat for the rest of the season. The race was all about strategy, of course, and I think McLaren did the best they could in the circumstances. Certainly, they gave Alonso a chance of winning, to the point where it seemed within his grasp mid-race. When he peeled off for his second pit stop, however, it was immediately apparent that this was Kimi's day - the stint was very short and extremely short-fueled, whereas Raikkonen was as quick on more fuel. The Ferraris had a considerable performance advantage, that was clear. Hamilton's strategy is being criticized now but it was reasonable in the circumstances. To stand a chance of pole (and therefore the win, judging by previous races this season), McLaren had to go for a light fuel load. It was not enough for Hamilton to build a lead in the first stint and that decided his finishing position. Third was all he could hope for from then on and I believe McLaren when they say that he protected the engine in the second half of the race, rather than try to stay with the leading pair. Massa's drive through the field to fifth place was no more than one would expect from a competent driver in the fastest car on the track. 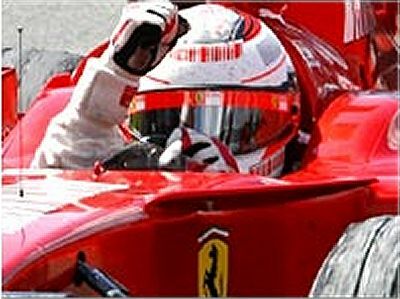 Had he not leap-frogged Heidfeld in the final pit stops, it is likely that he would have been stuck behind the German rather than Kubica; the performance difference between the Ferrari and the BMW is small enough to make passing extremely difficult. Further down the field, it seems that Renault are getting there gradually. Still not on the pace of the BMW's, they have closed the gap and are looking capable of challenging for third spot in the constructor's championship. Both teams have young second drivers who are beginning to come good, but note that the old hands, Heidfeld and Fisichella still put in faster race laps on the day. Having promised much in practice and qualifying, the Toyota team did a great job of fading in the race, neither driver making it to the end. Ralf must be wondering if he will ever get the chance to protect his seat for next year. Honda are making the best of a bad job, at last having returned to the 2006 car, and are showing the other chasing teams a thing or two about strategy. Both Barrichello and Button finished well above their qualifying positions purely because they went for one pit stop rather than two. This gave them a chance to move up the order and then keep the better position by being awkward to pass. It makes sense to me, anyway. Ah, the might-have-beens of F1. At least Scott was quicker than Liuzzi all weekend and has a slim chance of retaining his seat for next year if he can keep that up. For much of the race he was putting in similar lap times to the Renaults so the potential is there. But he really needs the breaks to start going his way so that he can score a point or two. So it was a race of strategy more than anything else. And Ferrari showed that, when you have a performance advantage, the strategy tends to fall naturally into place. Whether they keep that advantage remains to be seen but I doubt it. From now on I think it will be a matter of see-sawing fortunes, according to which circuit the race is on. It may be a two-horse race but the twists and turns, including the political chicanes, make it an interesting one. Kimi is the best. He's just one of those seat-of-the-pants drivers who has cool confidence and excellent judgment. His attitude stinks, but he doesn't get paid for attitude, he gets paid for driving. Montoya was the same style of driver, but lacked the cool and judgment. Massa proved he's terrific. Not many drivers could have come so far from the back of the grid, even in a superior car. I thought his drive was very Shoomy-like, but without the cheating. Alonso seems to me to always have an excuse. It also seems to me that he's one of many who can only win if they start at the front in the best car on the grid. Hamilton is fabulous, and will be all the better after he's been slapped down a couple of times. That's a pretty fair assessment, Stonesword. Obviously, I would rate Massa a little lower than you and excuse Alonso his excuses (and he did beat Michael Schumacher a couple of times last year when the Renault was not as quick as the Ferrari), but essentially we're agreed. And your last sentence expresses my feelings exactly! I have agree with Clive on this one, Alonso is something special, what he did last week should at least prove that. On a track with little to no passing in a series that has little to no passing, he made some insane passes. I'm surprised no one tried to run lean on the 3rd session qually. I would image they can control the fuel mixtures at the expense of some horsepower. I guess because of the length of the lap you wouldn't have been able to get enough 'slow' laps in to make it worth it. Secondly, I wish people would stop giving Hamilton credit for another podium. Eight straight was special, nine straight is lucky. Massa would have easily been somewhere in the top three had he not failed on the start. Even Hamilton seemed to sarcastically shrug when the crowd chanted louder for him than 1st or 2nd. I see a "Well thats why they run the race" cliche coming on. Actually, wouldn't they run the engine a bit rich in Q3 to burn off a bit more fuel? The whole idea is to get rid of as much weight as possible so that the last laps are as fast as they can make it. Which just goes to show how ridiculous it is to make them set the amount of fuel for the race before qualifying. What is the point, especially when the guys who don't make it to Q3 can put in as much fuel as they want after qualifying? Lets say they get into the top 10 but know they have little chance of cracking the top 6. Why not run a couple fast laps to set a time on a medium fuel load, and then run 10 minutes of fuel conservation laps. Without the 107% rule they can run at whatever speed saves the most fuel and still get the credit for running at full speed (more fuel used). They would then have a relatively good starting position with more fuel than the other 9 which could mean the difference between a position or two during pit stops. On the other hand. Having the fuel burn off laps not only sticks the foot in F1's environmentally friendly mouth, but it also adds further wear and tear on the engine which in turn costs more money. Not as much as building one lap wonder qualifying cars, but still it could be done better with a similar format. Leave the first two sessions as they are. Make session three a hot lap sessions with only one car on track. Each of the top ten drivers get 1 lap on race fuel. No more 'traffic' excuses from top drivers and it still leaves the first stint strategies in place. Leaving the first two sessions as is makes sure that the fastest drivers at least get into the final session. I have to say watching the race I thought Kimi was really supreme. In the first round of pit stops his laptimes were absolutely blinding, (I think a 1:20:600 at one point.) He managed to stay with Hamilton even on slightly more fuel despite Hamilton's attempts to obviously pull away. Also shows you how good his qualifying lap was, if he hadn't of made that mistake on the last corner I'm confident he would of got a faster lap than Hamilton and with more fuel. Coming up to the 1st pit stops where Hamilton lost quite a bit of speed, I thought that he was very lucky not to get taken out the way he defending himself. If Kimi wasn't such an experienced/great driver than Hamilton could easily of got collected when trying to defend his place briefly. Again on the second pit stops I thought Kimi was supreme sticking with Alonso even with lots of laps worth of more fuel. He sent in blinding lap after blinding lap in the time he was coming up to the pits and just how long he stayed out suprised me. He had a lot of fuel. Massa's drive up through the field I thought was quite impressive, for what I expect of him. Alonso did his best but couldn't match the raw pace of Kimi in his ferrari. Ah, you're talking really devious strategy there, Dan. I would guess that you're right - it would be a way of doing a couple of extra laps before having to refuel in the race. Since the cars that stay out longest seem to have an advantage, it would be good policy for teams like Toyota and Renault. Not absolutely sure it would work in reality, however - the performance difference between those two teams and the front runners is still a little too large to be bridged by strategy. I do agree that the fuel burn off session is a joke, however. In my opinion they should scrap the whole system and return to qualifying as it was before they started messing with it: you get an hour to go out there and set a time and that's it. So you get a bit of traffic? that's fine, just go out again and have another bash. And, if you leave your quick laps to the end and then get baulked, it's your own silly fault for not using the time available to put in a banker. To make that system work, there would have to be a stringent rule on tires. One manufacturer makes only two types of tire - a wet and a dry. No qualifiers, no soft and super softs or super anything else - a level playing field for all on the tire front in other words. That's the way I see it - simplify, simplify, simplify. Must admit I hated the one hot lap qualifying system; it was too unfair on those who had bad luck or were not one lap specialists. I agree, Pootle, I think we saw the Kimi of old on Sunday - real pace and car control. In my opinion he will show Massa the way for the rest of the year. I don't know..... With all the money thats being thrown around there must be people trying to figure how viable these tactics are. Mickey the shoe and his paralell parking. After watching the race one thing I was really glad about, Kimi's luck held out for once! Huray! Personally I've wondered how effectively a 1 stop stratergy would be if one of the front runners tried it. It would all come down to a excellent qualyfying lap. Then if they managed to keep people behind them with more fuel in the race, perhaps it could work. That's the problem really, Pootle - getting the good qualifying lap in when the tank is full. To some extent, McLaren try that with Alonso sometimes, although they don't do a one-stopper. The British GP was an example but the performance difference to the Ferraris was too great - all Kimi had to do was sit and wait until the McLarens went in and then put in some really quick laps. It is interesting to speculate how things would have gone if, instead of short-fueling him, they had given him enough fuel to go to the end. He would not have led the race when he came out but might have been able to go fast enough to pass the leader when he pitted the second time. All depends on what sort of lap times he would put in with a car that heavy. Looking at how Jenson sliced up through the field with a Honda that is improving but still not anywhere near as good as the Ferraris or Mclarens I thought it might be possible if like him you managed to keep people potentially faster than you behind you. Although I think with something like that it's a bit of luck too, if when finally you've burnt enough fuel to put good lap times in when you need to and you find some traffic heavy from their recent pit stops it can be a problem. Also noticeable that neither of the Hondas scored any points, they got close but not close enough. I think that's probably why the top teams tend not to gamble on different strategies. So much can depend on how much traffic there is when you emerge from your pit stop. The Hondas got the one-stop strategy right at Silverstone but remember that it was only a couple of races ago that they were being criticised for using the wrong strategy. They have to take a chance, the car being as poor as it is, and sometimes it works, sometimes it doesn't.